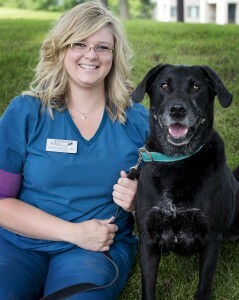 Jessica is a Certified Veterinary Technician and Office Manager at Anderson Lakes Animal Hospital. She is excited to help Anderson Lakes advance with new technology, new online presence, and continuing the rich tradition of exemplary customer service. Jessica joined our team in October of 2007 on an internship from Minnesota School of Business (Blaine Campus). Upon completion of her internship, she was offered a position as a Veterinary Technician here at Anderson Lakes Animal Hospital. She graduated with an A.A.S. degree in Veterinary Technology in the spring of 2008 and became state and nationally certified the next summer. She is a member of the Minnesota Association of Veterinary Technicians and the National Association of Veterinary Technicians in America. She is also a member of the Veterinary Practice Management Group-West, where she discusses current veterinary management issues affecting our community. Jessica’s interests include client education, surgery and anesthesia, and dentistry. Jessica has also volunteered with Rosie’s Rescue on Red Lake Reservation in northern MN. She helped care for animals in need of treatment, administered vaccines and educated owners on how to properly care for their pets. She recently attended the Western Veterinary Conference in Las Vegas, NV, where she continued her journey in the veterinary field by learning about the newest techniques and products available to veterinary technicians. In her free time, Jessica enjoys spending time with, family and friends, camping/outdoor activities, going to concerts and festivals, snuggling with her silly, 3-legged Siamese mix “Ragnar”. Jessica lost her beloved Jade (pictured here) in July of 2017. Jade will be greatly missed.